Fig. 3. 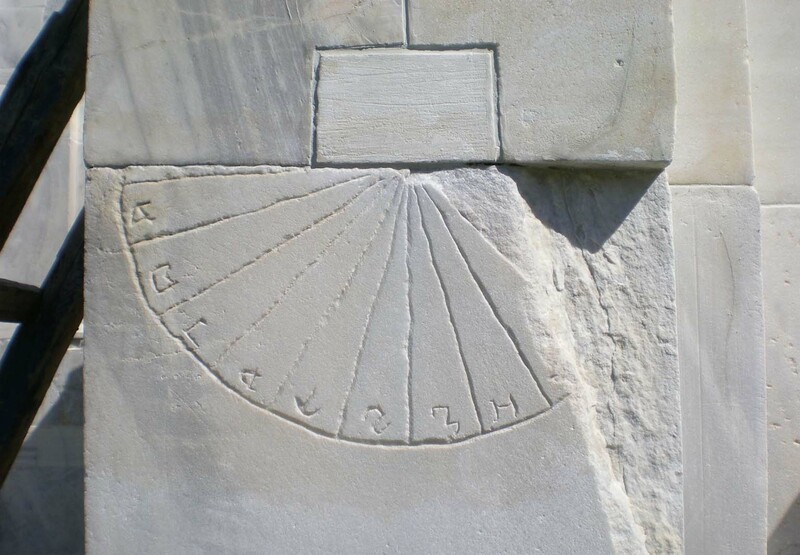 The reconstruction of the Studenica sundial (Museum of Science and Technology, Belgrade). The semi-circle hour plate (r=21cm) is divided into 12 equal hour sectors. In Byzantine fashion, the sectors are numerated by letters A, B, G, D, E, S , Z, H . The last quadrant of the sundial is missing (the one with Q, I, IA, IB). The gnomon is missing too, and it must have been fixed perpendicularly on the wall, in the center of the semi-circle shaped hour plate. This kind of sundial with differing numbers of the hour sectors (12, 8, 6, …) was very common in the Middle Ages, but it was not a sundial in the exact meaning of the word. These improvised devices dictated a unique division of the day which can be taken as a separate hour system: the visual-temporal system. Tadić, M. (2004). The Oldest Sundial in Serbian lands / Il piu antico orologio solare della regione Serba. Gnomonica Italiana, II (6), p. 23-25.